The first thing we did in the morning of day two was breakfast in a big room reserved for all the student-athletes. On the way there, Adriana, one of my teammates, AKA ‘Frenchie,’ showed me the student-athletes lounge. I didn’t know a student-athletes lounge existed. The lounge is a big room connected to another one, with all sources of video games, ping-pong tables, and other entertainment stuff, where athletes hangout during their spare time. Amber Strange, Coach Schindler and Blanca Izquierdo take a picture with the second grade class of Liberty Elementary School. The best part of day two was practice time. During the official practices, several NCAA members supervise that every team is following the rules and everything goes as planned. We were in our assigned locker room for the tournament, when a NCAA staff member came to bring us to the court, and what a feeling. This gym is the most beautiful and amazing gym I’ve ever seen and getting to play there is another dream come true. 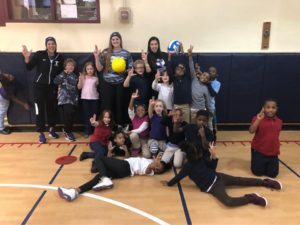 After practice, we visited Liberty Elementary School and had a fun time playing volleyball with the kids. We had dinner in a little, cute Italian restaurant 20 minutes down the road. I have a very weird superstition before important games; I am always looking for signs and I want to believe that I found a good one. As I was entering the restaurant, I had a Deja-vu and I thought that had to be a good omen. Also, I saw a shooting star; I’m guessing that counts too. On the ride back to the hotel, I texted my dad and we talked about Pittsburgh, about us, and about volleyball. He’s been my fan number one (along with my mom), since I started playing when I was eight. It’s funny how at the end of things, we always look back to remember why everything started. Remembering my very first volleyball games gave me another reason to enjoy every single second of tomorrow’s game. Somewhere behind the athlete I’ve become and all the experiences I’ve gone through is this little girl, and I just want to make her proud. The last message my dad sent me said “never stop being that little girl.” Dad, I will not. How could I have thought that one day, that eight-year-old who couldn’t make her serve over the net, will be about to play a National Championship in the United States? Strange world. We finally arrived at the hotel and had treatment with the trainers. I started to get nervous. The game was closer than ever before, and all types of feelings started flowing through me. One of the hardest things for an athlete is waiting until game time. I wish I could see the future—patience has never been one of my strengths. This excitement is something I am really going to miss after this weekend. For those who don’t know me, I am a very talkative person. However, a few hours before the game I got so quiet. I see this as the way my body tells me is time to focus. If I am honest, I am scared for tomorrow. I don’t want regrets, I don’t want “what ifs”. That’s why staying aggressive is important to deal with the pressure. It’s the moment to risk, to put everything at stake, pray, and hope for the best, because this is it; It might be all gone tomorrow. I don’t know what’s going to happen, but I do know that we are going to play our hearts out.